In the world of cupcakes, presentation is everything. 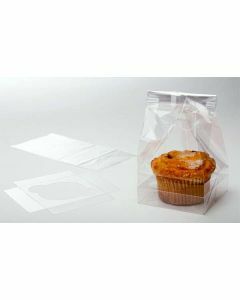 Whether you’re wrapping cupcakes for a customer or pre-packaging them to fly off the shelves, you need to make sure that your cupcakes are perfectly wrapped in packaging designed for your products – ideally all at an affordable price. 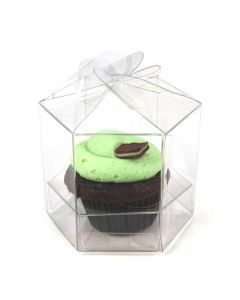 At ClearBags, we are one of the leading providers of cupcake packaging. 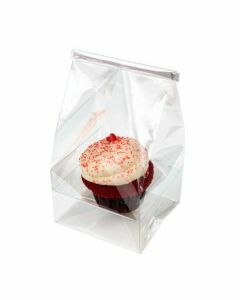 We offer both bags and boxes that are very popular with cupcake bakeries, and made from our popular Crystal Clear materials. Browse our inventory to find the bags or boxes that are right for you. 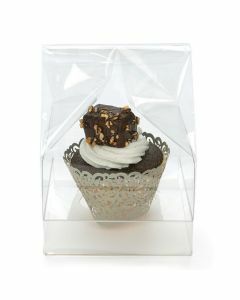 Give your solo cupcakes the special attention they deserve with this cupcake packaging set. 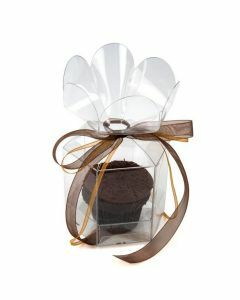 Our CBG1 cupcake set measures 4" x 4" x 7" and is perfect for holding a single cupcake or muffin. This set includes a lunch sack style gusset bag and a plastic insert for stability. Clear stickers are included for a secure closure. 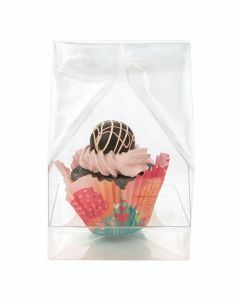 Full frosted cupcakes get a premium showing in this cupcake bag set. 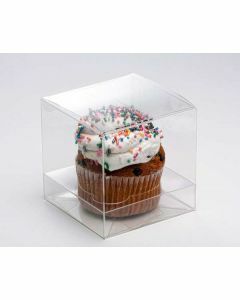 Our CBG1XL cupcake set allows extra space to accommodate a larger single cupcake or muffin. The set includes a 4" x 4" x 9" lunch sack style gusset bag and a plastic insert for stability. This taller 9" bag is ideal for taller and uniquely decorated cupcakes. Clear stickers are included. 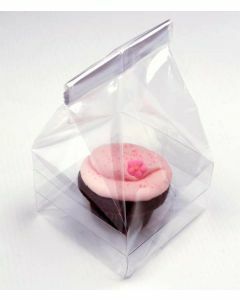 Personalize the experience of the solo cupcake with our CBG4 cupcake bag set. CBG4 includes a 4" x 4" x 7" flat bottom gusset bag, a plastic insert, and a paper bottom. This set holds a standard size single cupcake or muffin. The white cardstock bottom offers added stability and an upscale presentation. Jumbo cupcakes are worthy of their own special packaging. The CBG3 set is perfect for a single jumbo cupcake. 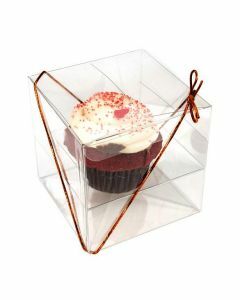 This set includes a 4" x 4" x 9" flat bottom gusset bag and a clear plastic tray for added stability so top-heavy cupcakes won't topple over. The lunch sack style bag offers extra room for layered frosting and decorations. Heat sealable. Unique cupcakes deserve their own personalized packaging. 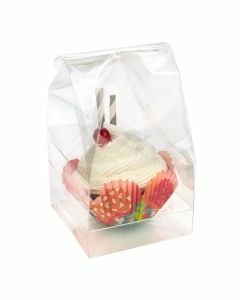 Our CBG4XL cupcake bag set includes a 4" x 4" x 9" flat bottom gusset bag, a plastic insert, and white paper bottom insert. This set is just right for a standard size single cupcake or muffin. The white paper insert offers an overall high-end look. Stickers are included for a tamper-resistant closure.